This is an easy and delicious sweet made during festivals. Since 7 cups of ingredients are used to make this, the barfi is named 7 cup barfi / 7 cup cake. It tastes like traditional mysorepa (the one with pores), with an added flavor of cashews and coconut, when done crunchier. As I preferred it to be rustic in look, I made it crunchier. You can make it soft too. See the post for details. 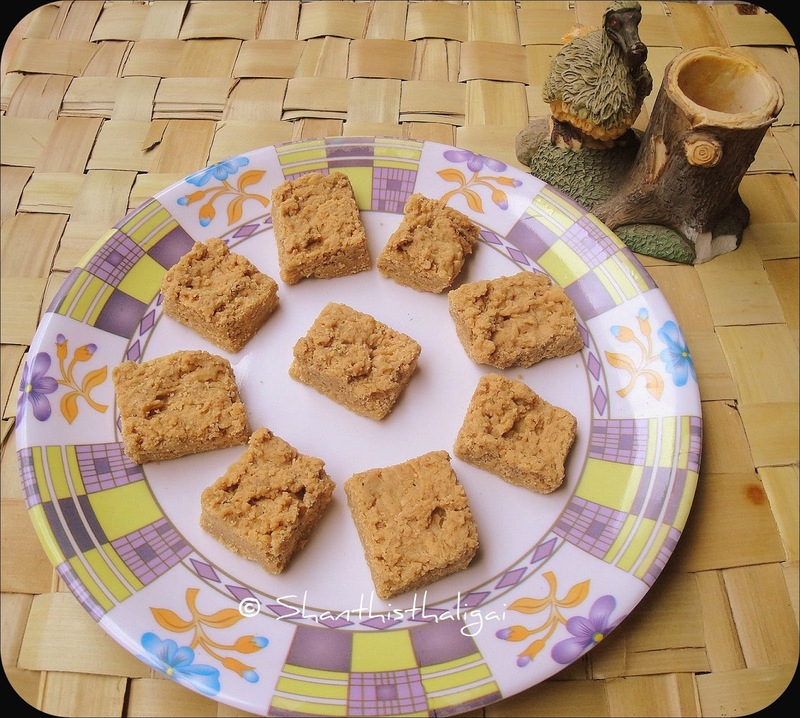 Even a novice cook can make this easy seven cup barfi. Sieve besan. Dry grind cashewnuts coarsely. Grease a tray and keep ready. Combine all dry ingredients in a heavy bottomed kadai and mix well. Add milk and ghee, mix well without any lumps. Now, keep kadai on the stove and stir continuously in medium flame. When the mixture starts to boil, reduce the flame to low and keep on stirring. After some time, the mixture will start leaving the sides of the kadai and start to froth. Check by dropping a small drop in a plate. It should firm up. This is the consistency. Pour the mixture on the greased tray if you like a soft set burfi. Personally, I like it crunchy. To get it crunchy with rustic look, I kept the mixture on stove for a couple of minutes more. Even the surface gently with a spatula. When warm, cut into desired shape. NOTE: It can be done with 3 cups of sugar minus cashews. As I felt sugar would be more and also wanted it to be rich, I made like this. Any nuts can be substituted for cashews. Aunty boiled milk should be used ? ?